Kesteven and Sleaford High School pupils are part of the Sleaford Joint Sixth Form; this is a collaboration of the co-educational sixth forms of the Robert Carre Trust (comprising of Kesteven and Sleaford High School and Carre’s Grammar School) and St. Georges Academy. High standards of teaching and learning and academic success are well known features of each of the schools. 82% of students within the Robert Carre Trust were considering University after the sixth form. 75% of those students secured their first place (firm offer). 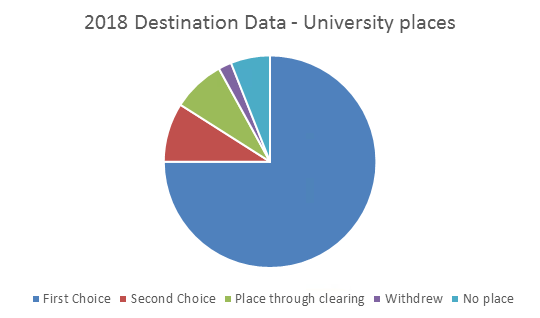 9% of students have taken up their insurance offer whilst a further 8% secured a place through clearing. 2% have now decided to withdraw from the process leaving 6% without a university offer at this time.